EU professional migration to the UK is down 26 per cent. The latest LinkedIn Workforce Report reveals that since the Brexit referendum the flow of talent has reversed, the UK is losing talent to the EU, and other potential sources of skills are not filling the gap. What does this mean for professionals, businesses and policymakers? In this post, Joshua Graff (LinkedIn) writes about the real shape of Britain’s post-Brexit talent brand. We’ve had to wait to see if the referendum would affect the number of people from different countries moving to the UK. Now, two years on, we know it did. Ever since the vote to leave the European Union, both sides of the Brexit debate have been debating the real impact of that decision. This has played out in an atmosphere of deep uncertainty and minimal hard data. Changes to people’s confidence in a country take time to manifest; people aren’t able to relocate from one country to another overnight, and they equally aren’t always able to cancel plans that were already in place. In the aftermath of Brexit, LinkedIn data quickly showed that fewer people from the EU were showing an interest in taking up jobs in the UK. However, these changes to sentiment were only a tiny part of the overall picture. This period has also seen economic growth in the world accelerate, with unemployment falling across the major economies, reaching lows not seen for generations in the UK. This optimism can mask deeper changes in the economy, but through the lens of LinkedIn’s insights, we’re able to look beneath the surface. We also needed to put any changes to migration into context. Would a fall in EU migration to the UK make it harder to access the skills that the UK economy needs to grow? Or would they simply mean those skills coming from somewhere else, potentially creating more opportunity for UK professionals or those from countries outside the EU? Neither side can claim to understand the real impact of Brexit without data that answers these questions. That data is now emerging. By analysing hiring trends over the last two years, and comparing this to research amongst recruiters themselves, we can start to provide the answers with some confidence. LinkedIn hiring data, captured in our monthly UK Workforce Reports, shows that the UK has gone from being a country that gains talent from the EU to one that loses talent to it. The change is significant. Over the last year alone, migration to the UK from the EU has fallen 26 per cent, while more people are leaving the UK for the EU than were previously. This month we’ve also surveyed 600 recruiters and asked them for their perspective. The results back up our findings. Almost half (44 per cent) of recruiters believe that the UK has become less attractive to candidates from the EU since the referendum. Your view of this change probably depends on your view of Brexit and of Britain’s place in the world. The reversal of talent flows between the EU and the UK has the potential to harm the UK economy as businesses struggle to source the skills they need, and companies reconsider locating here due to a perceived talent shortage. However, it could also open up more opportunities for UK professionals or those from other countries outside the EU, who can step in to meet the demand. 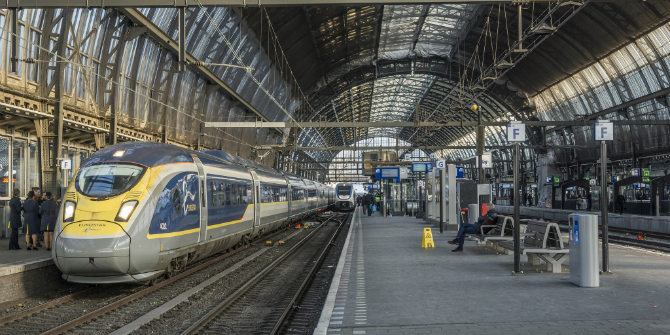 Eurostar Amsterdam. Image by TGr_79, (Flickr), licenced under CC BY-SA 2.0. 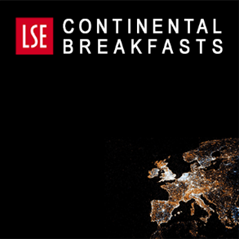 Is Britain becoming more global and less EU centric? To see the real impact of Brexit on the UK talent market and economy, we therefore have to look beyond the EU migration figures. Are we seeing evidence of businesses sourcing these missing skills from elsewhere? So far, the answer is no. Rather than an increase in the number of professionals moving to the UK from non-EU countries, net migration to the UK from the rest of the world is also dropping. In fact, it’s down 20 per cent over the last year, almost as significant a reduction as migration from the EU. The UK remains a net importer of talent from non-EU countries, because the number of professionals leaving for these countries is still lower than the number arriving from them. However, it is importing talent at a significantly lower rate. Are UK professionals filling the skills gap? For those who would like to see a more global Britain after Brexit, this should be a concern. Professionals from outside the EU are facing no new residency or visa hurdles following Brexit. There is no practical reason for a decreased appetite for moving to the UK. Instead, we seem to be seeing a shift in perceptions, with the UK’s reputation as a place to advance your career on the decline. Our survey of recruitment professionals provides more evidence, with 28 per cent saying that they believe the UK is now less attractive to candidates from outside the EU than it was before Brexit. There’s no better example of this critical perception shift than Ireland. This is a country that shares a common travel area with the UK that predates either country joining the EU. The UK has been seen as a place for Irish professionals to gain experience for decades. However, our data now shows migration from Ireland dropping 37 per cent over the last year, the biggest decline of all EU nations. Does reduced migration from overseas mean more opportunities for British professionals? We can test this hypothesis by looking in detail at London, traditionally the UK’s largest net importer of talent from abroad. London has not been immune to the switch in migration flows, and is also now losing talent to other countries rather than gaining it. However, domestic migration into London is unchanged. It is not increasing to fill the gap. This seems to be contributing to an increasingly acute skills gap within the UK’s capital. Over half (54 per cent) of HR professionals and recruiters in London say that Brexit is having a ‘big’ or ‘huge’ impact on businesses’ hiring strategies. LinkedIn does not analyse and release hiring data to prove a point for one side or another. We share this data because it is the best possible basis on which to make decisions, which we hope will make our members more productive and successful. The more hard evidence we have of what’s actually happening to the UK workforce, the more effectively we can move from arguing about facts to developing strategies to respond to them. It’s now increasingly clear what those strategies must involve the government, business leaders and professionals themselves. Those advocating for a more global Britain, with London as a dynamic international hub of industry, need to move quickly to address the perceptions that are taking hold. We talk about talent brand a great deal at Linkedin. Well, countries have talent brands too, and Britain’s is not supporting the global vision. Unless this changes, businesses might struggle to source the skills they need to grow, and others will reconsider locating and investing in the UK. This doesn’t just mean fewer opportunities for migrants from abroad; it means fewer opportunities for UK citizens too. Skills gaps as a result of falling immigration ought to create opportunity for British professionals. However, it’s clear that this is not happening automatically. To fill these gaps, people need information about the opportunities, the flexibility to take on new jobs that might be in a different place, and access to education and training to prepare for them. Both government and businesses need to focus more on how they can unlock this potential. Professionals should be mindful of these changes as they plan their big decisions. If you’re a European in the UK, your skills might be becoming rarer and more valuable, and if you’re a from elsewhere in the world, and were thinking of coming to the UK to work or study, now could be a fantastic time to get the dream job, or a place on the course that will help accelerate your career. CEOs of UK businesses have an urgent to-do list if they are to navigate these changes successfully. This starts with taking a closer look at their own talent pipelines. Are they seeing the same post-Brexit effects reflected there? And if so, can they adjust and amplify their own employer brand to compensate for changing perceptions of Britain as a whole? If they are facing skills shortages due to falling migration, they will need to develop strategies for upskilling existing employees or hiring and developing UK professionals with the potential to fill the gap. And they’ll need to move swiftly, because these types of solutions take time. Above all, it’s never been more important for businesses to communicate openly and clearly with policymakers about the impact that Brexit is having. Whether working through professional associations or speaking to government directly, it’s vital to make the case for the importance of accessing the talent that you need. Too much discussion about the impact of Brexit falls predictably along the lines of people’s pre-existing views. It’s now time to move beyond that. And a clearer view of what’s happening across the business landscape is the best way to do so. This article first appeared on LinkedIn, and it represents the views of the author and not those of LSE Brexit. 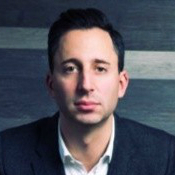 Joshua Graff is UK Country Manager & VP EMEA at LinkedIn. As a Leave voting UK professional, I’m very pleased about this. My skills will be more in demand. And the UK will offer services by less skilled employees, therefore lower quality services, therefore less competitive in the global market, therefore a poorer country. too many people in the U.K. from my short time returning to the uk after 20 years in europe. i will seriously consider returning to the UK to work for the next 10 years or so, as now ‘hors Europe” there are many opportunitys UK side, and i can expect a decent payrise. Europe was pretty ok in the beginning (well in Paris it was) but then, further down the line things got worse. fewer jobs when adopting the EUro currency (though that was put down to the war in iraq at the time.. the msm and pro europe French government at the time played that card to the fullest..) more expensive, pay rounded down.. i do smile when i read of some pro remainers stating that europe has protected the worker- just today i spoke with friends in france and a1300 euros/month wage is ‘monnaie courant’- apparently many people are on that wage in France. all good news for the UK when work and skills are rewarded. One reason i emigrated to Australia professionally was that i was convinced the ‘project fear’ would have its effect and the uk would become the densest populated country on the planet. having the choice is good, having no choice (staying in the EU) definitely bad. 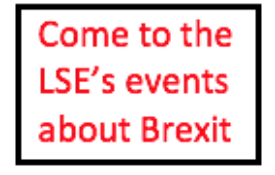 I do love reading through posts on the partially EU funded LSE from remainers who vaunt the merits of the EU and being able to travel freely, and the appalling loss they will suffer from BREXIT when in reality they have never learnt a foreign language to native level to employed above locals, and never written a cv in aformentioned foreign language or successfully gained full time permanant employment through a interview (s) conducted in a foreign language. Or did they imagine it was all ‘holidays and gap yahs’ ?